A new species of marine worm that lives off whale bones on the sea floor has been described by scientists. The creature was found on a minke carcass in relatively shallow water close to Tjarno Marine Laboratory on the Swedish coast. Such "zombie worms", as they are often called, are known from the deep waters of the Pacific but their presence in the North Sea is a major surprise. A UK-Swedish team reports the find in Proceedings of the Royal Society B.
Adrian Glover and Thomas Dahlgren tell the journal the new species has been named Osedax mucofloris, which literally means "bone-eating snot-flower". "The part of the animal that is exposed to the seawater is covered in a ball of mucus, so they are quite snotty. That is probably a defence mechanism." Scientists have recently begun to recognise the importance of "whale fall" to ocean-floor ecosystems. When the great marine mammals die and drift down to the sea bed to decay and disintegrate, they provide a food resource for a host of different organisms. Finding these locations to study is not easy, though. In October 2003, Glover and Dahlgren sank the remains of a dead, stranded minke whale in 120m of water and monitored what happened to the carcass over a period of months using remotely operated vehicles. In August 2004, the team was able to recover a bone from the skeleton. To their astonishment, it hosted a type of marine worm previously only thought to exist at great ocean depths - down to almost 3km in the Pacific on the bones of gray whales. Glover and Dahlgren say there are remarkable similarities between the worm species, despite being separated by two ocean basins and more than 2,500m in the water column. 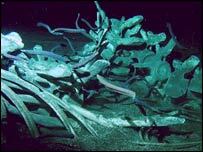 They root themselves to the whale bones which they then plunder for oils with the help of symbiotic bacteria. 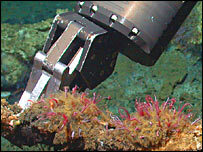 The worms' flower-like plumes pull oxygen from the water. Their reproductive system is extraordinary - certainly in the case of the Pacific Osedax. "The female Pacific worms keep males inside their tube as a sort of little harem that fertilises eggs as they are released into the water column," explained Dr Glover. "We're not sure what's happening with the reproductive biology of the Swedish worms yet. We've only got females; we haven't found any males. It's a bit weird." This has given rise to the theory that whale falls may act as "service stops", or hopping points, that allow some lifeforms to move around the ocean floor. 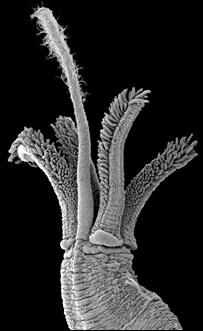 Glover and Dahlgren, who is affiliated to Goteborg University, intend to study their North Sea worms further in the laboratory.